Born in San Francisco, California, Sarah Lane began her dance training in Memphis, Tennessee under the direction of Pat Gillespie at the Memphis Classical Ballet. When her family moved to Rochester, New York, she continued instruction with Timothy Draper and Jamey Leverett at the Draper Center for Dance Education. 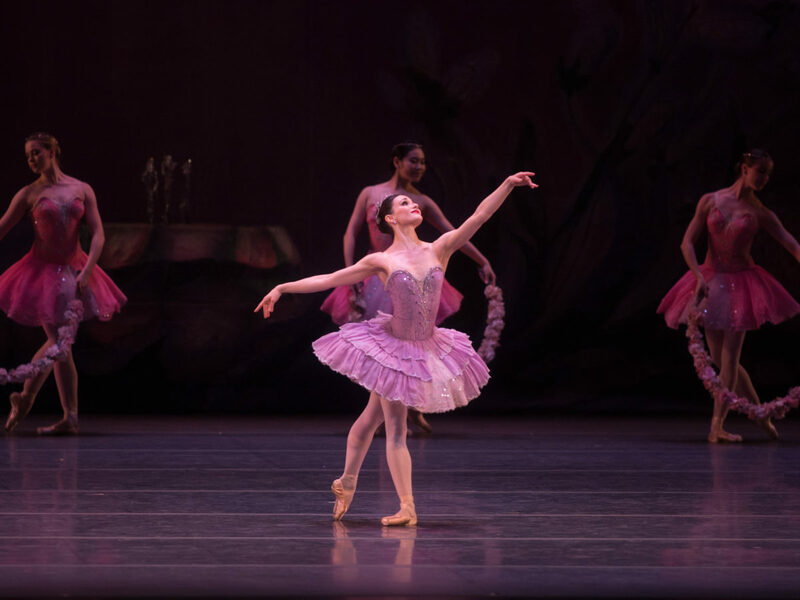 When Lane was 16, she received a full scholarship to the Boston Ballet’s Summer Program. In 2000 and 2001, she was awarded first place and the Capezio Class Excellence Award at the North American Ballet Festival. In 2002, Lane was a Young Arts Winner in Dance/Ballet, and through Young Arts became a 2002 U.S. Presidential Scholar in the Arts. Lane was the Silver Medalist, the highest medal in the Junior Division, at the Jackson International Ballet Competition (2002). During the competition, she traveled to Washington, D. C. to perform at the Kennedy Center as a Presidential Scholar in the Arts. That same year, Lane also won the Bronze Medal at the Youth America Grand Prix Competition. Lane joined American Ballet Theatre as an apprentice in August 2003, became a member of the Company’s corps de ballet in April 2004 and was appointed a Soloist in August 2007. She was promoted to Principal Dancer in September 2017. Her roles with the Company include Nikiya and a Shade in La Bayadère, Galya in The Bright Stream, the Fairy Spring in Frederick Ashton’s Cinderella, Blossom in James Kudelka’s Cinderella, Swanilda in Coppélia, Gulnare in Le Corsaire, Kitri, Amour and a flower girl in Don Quixote, Anne in Christopher Wheeldon’s VIII, Giselle, the Flames of Paris pas de deux, Giselle and the peasant pas de deux in Giselle, Golden Cockerel in The Golden Cockerel, Young Girl in The Green Table, Columbine in Harlequinade, the Two of Diamonds in Jeu de Cartes, Vera in A Month in the Country, Clara, the Princess in Alexei Ratmansky’s The Nutcracker, Olga in Onegin, Other Dances, Youngest Sister in Pillar of Fire, one of Juliet’s friends in Romeo and Juliet, a Celestial in Shadowplay, Princess Aurora, Princess Florine and Miettes qui tombent (Breadcrumb) in Ratmansky’s The Sleeping Beauty, The Young Girl in Le Spectre de la Rose, the pas de deux from Stars and Stripes, Odette/Odile, the pas de trois, Polish Princess and a little swan in Swan Lake, Waltz in Les Sylphides, a Goat in Sylvia, the leading role in Theme and Variations and roles in Bach Partita, Birthday Offering, The Brahms –Haydn Variations, Chamber Symphony, Désir, Drink to Me Only With Thine Eyes, Glow – Stop, Her Notes, In the Upper Room, Kaleidoscope, The Leaves Are Fading, Monotones I, Raymonda Divertissements, Seven Sonatas, Sinatra Suite, Some Assembly Required, Souvenir d’un lieu cher, Symphony in C and With a Chance of Rain. She created the Chinese Dance in Alexei Ratmansky’s The Nutcracker, the Fairy Miettes qui tombent (Breadcrumb) in Alexei Ratmansky’s The Sleeping Beauty, Miranda in The Tempest, Princess Praline in Whipped Cream and a role in Demis Volpi’s Private Light. Lane was a recipient of the Princess Grace Award in 2007 and a 2008 Leonore Annenberg Fellowship in the Arts. She was the dancing double for Natalie Portman in Fox Searchlight Pictures’ feature film Black Swan. Ms. Lane's performances at American Ballet Theatre are sponsored by Donna and Richard Esteves. Sarah Lane in Theme and Variations © The George Balanchine Trust. Sarah Lane in The Sleeping Beauty. 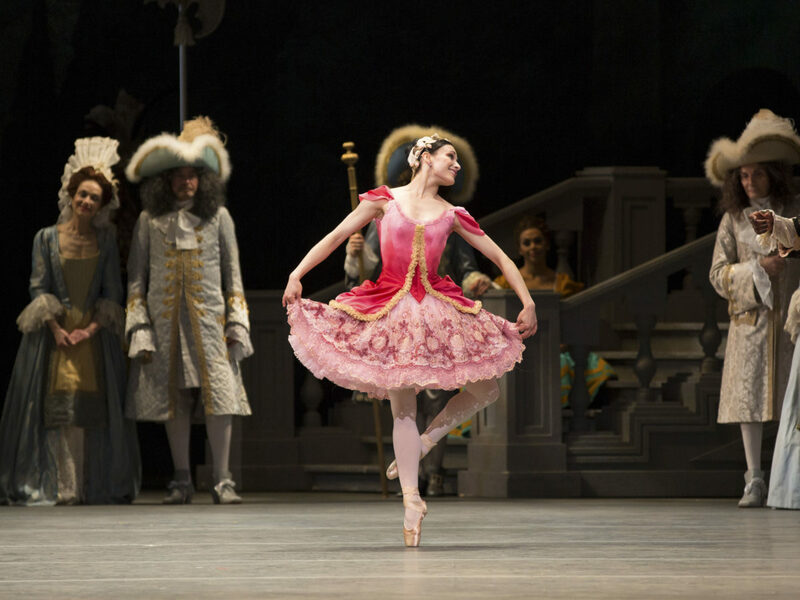 Sarah Lane in The Nutcracker. Sarah Lane in Le Corsaire. "What dancers experience goes beyond what words can express. To put it feebly, it is the ability to set your soul free in a moment that can't be captured or replicated. It's being real and vulnerable enough to share who you are as a unique human being. It's believing that imperfection can still create something beautiful." "Lane has that special quality, a certain grace, and along with her proportions and her sheer joy for dancing, she radiates, reminding me of a young Margot Fonteyn"
"Sarah Lane has turned out so many memorable performances that it’s hard to name them all...but more rewarding is her vivid projection, plush upper body, sharp dramatic instincts and refusal to throw away any part..."
"Beyond “just” Romantic style, Lane displayed another quality entirely. For want of a better word, call it soul. It permeated everything she did, but it was particularly evident in Act II. If you ask for a description – I can’t provide it, but I know it when I see it. Lane wasn’t playing a part – she was Giselle." "In 'Theme’ [Theme and Variations] Lane’s footwork is both sparkling and clear. As petite as Lane is her manner in ‘Theme and Variations’ is that of the grandest ballerina."